PJTSAU UG admissions Combined Counselling dates 2018 for Bi.P.C. Stream courses / PJTSAU-PVNRTVU-SKLTSHU-Agriculture Degree Admissions Counselling Dates 2018 Notification, B.Sc.(Hons.) Agriculture; B.V.Sc.& A.H.; B.F.Sc. and B.Sc.(Hons.) courses admissions counselling. Telangana Agriculture Degree Admissions Counselling Dates, PJTSAU Degree Agriculture Admissions Counselling 2018, Agriculture Degree Admissions 2018, UG Courses /Under Graduate Programme. PJTSAU UG admissions Combined Counselling dates 2018 for PVNRTVU, SKLTSHU courses. The Professor Jayashankar Telangana State Agricultural University(PJTSAU) issued the UG Courses admission notification in the month of August, 2018. This notification shall be treated as an individual intimation and no separate intimation will be issued. Open Competition (OC) means all eligible candidates belonging to all categories viz., BC, SC & ST and special categories as per the ranks indicated in the table (by order of merit only). On 04-10-2018, 05-10-2018 only the seats under Open Competition will be filled up irrespective of the category to which a candidate belongs. Candidates under reserved categories, who do not secure a seat under Open Competition will have to attend counseling once again on respective scheduled dates of the category to which they belong. For the Un-Reserved (Non-Local 15%) quota, any candidate from Telangana / Andhra Pradesh / Un-Reserved with Telangana EAMCET-2018 Rank can compete on merit basis. The candidates are informed that the duration of B.V.Sc. & A.H. course is of 5 ½ years as per the recent regulations of Veterinary Council of India, New Delhi. The pattern of education for B.V.Sc. & A.H. course shall be on annual system basis. The candidates are required to produce all the relevant original certificates at the time of counseling failing which the candidature for admission will be rejected. The selected candidates will have to pay the requisite fees including deposits immediately failing which the seat will stand cancelled. Hostel accommodation will be provided subject to availability. Fees once paid to the University will not be refunded under any circumstances. In case a candidate cancels his/her admission the candidate has to pay cancellation fee as per the norms of the respective Universities in addition to forfeiting the fees already paid. Selection of candidates under BC, SC & ST quota is subject to clearance of the respective social status by the respective Directorates of Government of Telangana. The provisional selection under BC-E category is subject to the final adjudication (in W.P.No. 15267 of 2007) in the Hon’ble High Court. The guidelines issued by Government of Telangana from time to time shall be followed scrupulously. In event of establishment of any new college, the seats therein of shall be filled up through this counselling only. Candidates called for counselling will have to attend at their own cost and only one parent / guardian of the candidate will be allowed to accompany the candidate during the counselling process. The Universities do not guarantee any employment to the candidates joining the courses. Candidates are required to read the prospectus thoroughly before attending the counselling. The counseling will be conducted on all the days as notified in the schedule. The counseling process is likely to extend late into the evening, hence the candidates and parents/ uardians are requested to come well prepared for the same. Counseling for admission under NCC, CAP (Defence) and P.H. quota will be held separately and a suitable notification will be placed on the University website (www.pjtsau.ac.in) at a later date. More number of candidates than the availability of seats (1:6) are called for counseling and hence, mere attendance / participation during counselling does not guarantee admission. Candidates should report at the counseling center an hour before the scheduled time. Certificates / documents other than those uploaded will not be entertained or considered for the allotment of seats. Candidates belonging to BC, SC & ST categories should bring two Xerox copies of their caste certificate to be submitted at the counselling center. The candidates are informed to visit University website www.pjtsau.ac.in regularly for latest updates. The seats reserved for various categories such as BC, SC & ST will be filled up on the dates indicated in the schedule. Combined counselling for admission into under-graduate courses of Professor Jayashankar Telangana State Agricultural University, P.V. Narsimha Rao Telangana Veterinary University and Sri. Konda Laxman Telangana State Horticultural University for the academic year 2018-19 viz. B.Sc.(Hons.) Agriculture/ B.Tech. (Food Technology)/B.V.Sc.&A.H./B.F.Sc./B.Sc.(Hons. )Horticulture will be conducted from....2018 onwards based on Telangana State EAMCET-I 2018 Ranks for the candidates who have already applied. The counselling for the candidates of Telangana State AGRICET-2018 for admission into B.Sc.(Hons.) Agriculture will be held on as per above mentioned schedule. Hostel facility for the candidates selected for admission will be provided at the respective colleges subject to availability. The details of the counselling are placed on the websites www.pjtsau.ac.in, www.tsvu.nic.in and www.skltshu.ac.in. The combined counselling for admission into under-graduate courses of Professor Jayashankar Telangana State Agricultural University, P.V. Narsimha Rao Telangana Veterinary University and Sri Konda Laxman Telangana State Horticultural University for the academic year 2018-18 will be held as per its schedule and Please visit www.pjtsau.ac.in for details. 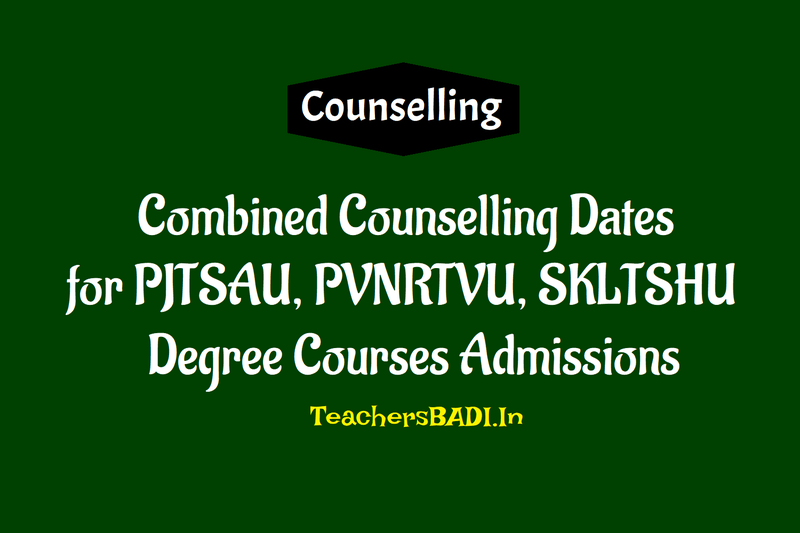 Combined counselling for admission into under-graduate courses (Bi.P.C. stream) of Professor Jayashankar Telangana State Agricultural University, P.V. Narsimha Rao Telangana Veterinary University and Sri Konda Laxman Telangana State Horticultural University for the academic year 2018-19 viz. B.Sc.(Hons.) Agriculture/ B.V.Sc. & A.H. / B.F.Sc. / B.Sc. (Hons.) Horticulture will be conducted on .... October, 2018 to fill up the vacancies remaining after the First Phase of the counselling based on Telangana State EAMCET-2018 Ranks for the candidates who have already applied. Venue: See counselling notification.